Aam Aadmi Party leader and CM of Delhi Mr. Arvind Kejriwal asked CIC about the truth of PM Modi’s M.A. Degree. The CIC ordered Delhi university and Gujarat University to investigate his degree. The Gujarat University has given the evidence of PM’s M.A. degree on 29th April 2016 along with a photograph clearly showing his registration number, name, and percentage. But, this news has disturbed Aapians. Many senior AAP leaders are acting like a frustrated kid. Mr. Sanjay Singh has also joined this list. 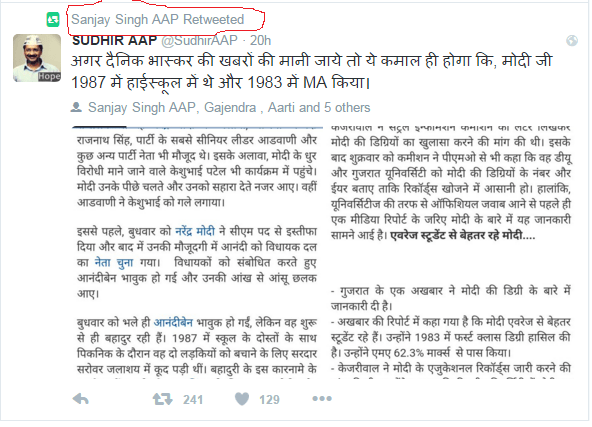 Mr. Sanjay Singh has retweeted a tweet of his supporter whose tweet has no sense and evidence. 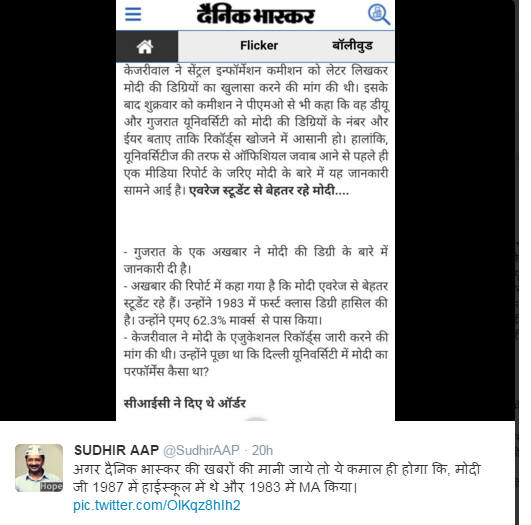 A tweet has been posted from a twitter account “@SudhirAAp” along with a screenshot of Dainik Bhaskar website that says “अगर दैनिक भास्कर की खबरों की मानी जाये तो ये कमाल ही होगा कि, मोदी जी 1987 में हाईस्कूल में थे और 1983 में MA किया।”. This tweet was retweeted 241 times including Mr. Sanjay Singh from his official blue verified account “@SanjayAzadSin”. Now, I will show the full screenshot of the images posted by this account. Read it and see there’s nothing written that Modi and Anandiben had pursued high school together. The image is saying that “Anandiben and Modi studied in the same school only”. Its a common sense that a 10-year kid can also differentiate this meaning. Here is the second image of this tweet showing the Modi’s passing year and percentage. 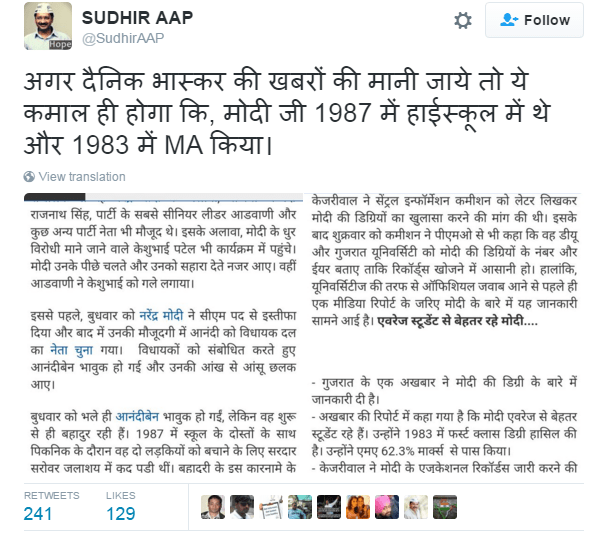 So, where is it written that Modi has completed his degree in 1983 and pursued high school in 1987? So, is it possible if a PM of India will pursue high school at the age of 37 and media will hide this report? No, way. But, political parties and their blind supporters will do anything to blame and criticize others. But, its not expected from Mr. Sanjay Singh. He is the senior most leader of AAP and doing this kind of mistake. It means you don’t read the tweet that favors you and re-tweet it with your followers. Its a poor politics played by AAP to damage the reputation of Indian PM and India at international level. 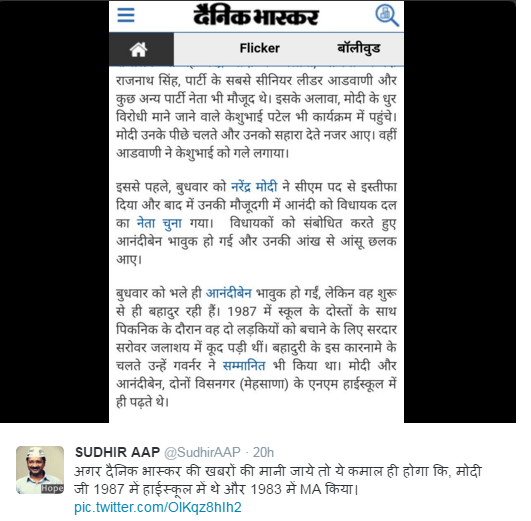 It’s a humble appeal to AAP leader’s don’t do cheap politics on social media.